If you fancy brushing shoulders with luxury, a day out at the Singapore Yacht Show will be just up your street. From the tallest to the longest boats in the show, there is variety. S/Y Vertigo is a 67 metre, beautifully engineered floating palace.With five cabins it can sleep 12 guests as well as 12 crew. The attention to detail in the interior makes it a piece of art in itself, with sweeping curves and soft lines. “Yachts are beautiful platforms for enjoying yourself and engaging with your environment,” said Tom Debuse from Y.Co, the yacht’s Charter Manager. But it comes with a pretty price tag, setting you back €225k (S$388k) per week in the low season. But it comes with a pretty price tag, setting you back €225k (S$388k) per week in the low season. The tallest ship at the show is the Royal Albatross, and if you have a head for heights there’s an opportunity to climb the rigging. Ladies – make sure you’re not wearing a dress. 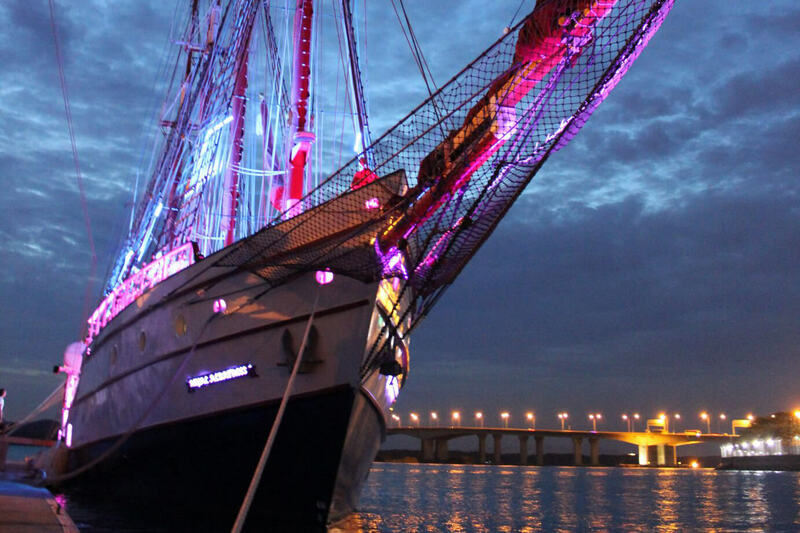 With 22 sails on a traditional square rig, and a luxury interior with five cabins, and state of the art lighting, audio­visual and navigation equipment, it is a unique ship. Visitors will see more than 100 boats, yachts and superyachts at the show with a collective estimated value of $500 million. Around 50% larger than last year, this is the show’s fourth year, and it looks set to be a staple on the boating calendar. But it’s not just for boat lovers. On Saturday visitors will be able to see a convoy of 50 Ferraris, followed by 20 Lamborghinis on Sunday. There will be fashion shows, live music performances and children’s entertainment. The Singapore Yacht Show 2014 runs from 10 – 13 April at ONE °15 Marina Club, Sentosa Cove. Tickets are $50 for a single day or $80 for a multi­day-pass and can be purchased from the Singapore Yacht Show visitor registration page (http://www.singaporeyachtshow.com/visitor­registration).